Jenna and Graham flew in from the UK to celebrate their wedding in the lovely St Marks Church right in the center of Florence. Pastel coloured roses and babies breath for the bridal bouquet and bridesmaids bouquets. For the church Jenna wanted Babies breath pomanders that would later be used in the villa again to add some extra decor. The venue was just outside on the hills of Fiesole in Villa di Maiano, a splendid villa which was part of a midieval village first built in the 11th century. Pastel colored roses and lysianthus for the centerpieces in tall candleholders for a rich and summery look. Lene and Oyvind had a lovely wedding nordic style. They rented a beautiful farmhouse in Tuscany and had their ceremony outside with a breathtaking view on the beautiful Tuscan hills. 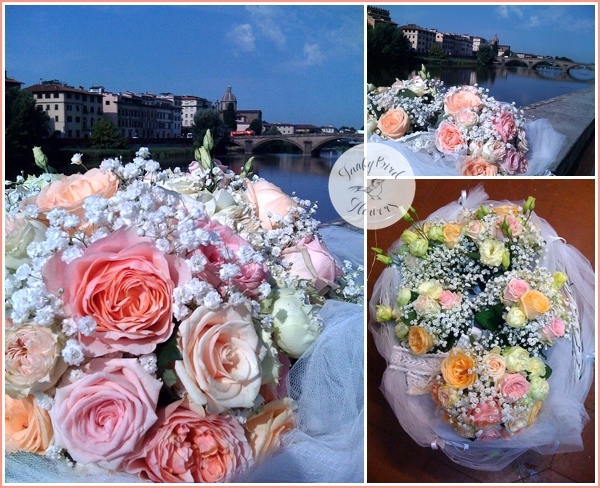 La renna di Toscana organized the wedding perfectly and we were there to take care of the floral arrangements and photography. What a beautiful day ! Melanie and Barry invited their friends and Family to stay and celebrate their wedding in a beautiful Farmhouse. Melany had a ball gown wedding dress that made her look like a princess in a fairy tale. The whole group enjoyed their stay and had so much fun celebrating. This couple did exactly what they wanted their wedding to be, a big big happy gathering of loved ones to make this a day they will cherish forever.